One of the truly incredible things about Scala is that it really inspires people to consider problems that they never would have attempted before. Recently, the urge came upon me to try my hand at some more advanced text processing. Not quite so advanced as a full language, but more complicated than can be easily handled by regular expressions. As usual, Scala proved more than up to the challenge. All of us have evolved more-or-less ad hoc methods for handling simple text processing. In this modern age, it’s almost a requirement to be familiar with basic regular expressions, or at the very least split, subString and find. These techniques tend to work well in small-scale applications, but things become a bit muddled when trying to deal with more complex or conditional representations. It gets even worse when you must perform some sort of complex resolution on the results of your parsing, requiring you to devise an intermediate form. One such example of a more complicated text parse would be the C-style printf function. Java has had this functionality since 1.5 in the form of PrintStream#printf(...) as well as String.format(String, Object...); but unfortunately, Scala lacks this highly useful method. Oh, it has a printf function, but it doesn’t support C-style syntax for reasons of backwards compatibility. This caused me no end of grief when I was trying to construct a quine in Scala. Since Scala has no printf, I decided to try my hand at implementing one (just for kicks). As I said, the ad hoc parsing techniques may serve us well when we’re just trying to split a full name into a firstname/lastname tuple, but I’m afraid that printf requires a more disciplined approach. Fortunately, there are a number of beautiful formalisms for dealing with text parsing. Chief among these are deterministic finite state machines. If you took formal language theory in college, you’ve probably already worked with DFAs (Deterministic Finite Automata), NFAs (Non-deterministic Finite Automata) and PDAs (Pushdown Automata); but since everyone I know slept through that class, I’ll just assume that you did too and go over some of the basics again. Finite state machines (automata) are at the core of Turing’s seminal thesis on computability. Actually, the so-called “Turing Machine” is at the core of his work, but DFAs are really just a limited form of this concept. The ideas behind the acronyms are very simple: a finite state machine is a collection of “states” which have connections to each other which dictate ensuing states or termination of the execution. 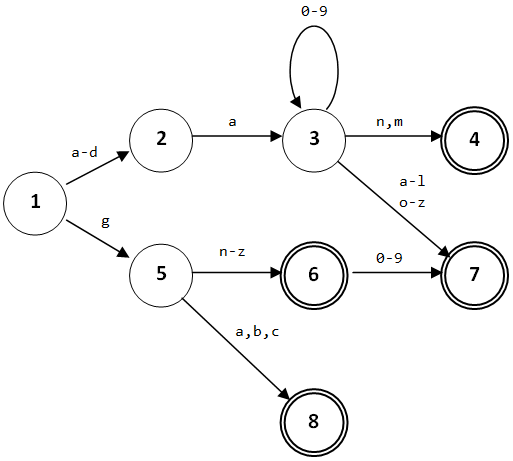 The most common representation of a DFA is a directed graph. The states are represented by the vertices of the graph. The double-circle indicates an “accepting state”. This is a simple DFA which has four accepting states (4, 6, 7 and 8). There is also a loop transition on state 3. Each of these states represents a different position (or “state”, hence the term) in the parse process. The idea is that you consume just one character at a time and based on the character value, the automaton “chooses” the correct transition. It’s all very mindless, very sequential (hence the name “automaton”). The only problem here is there may not be a transition for every possible character. For example, starting from state 1, we know how to handle characters a, b, c, d and g, but what happens if we actually get an s or a 7? By some definitions, this failing would indicate that we have an invalid DFA, something which is obviously bad. Most representations however allow unsatisfied input and merely have an implicit transition to an accepting error state. Most common applications make use of this rule (we’ll get to that in a minute). Notice how every parse starts with the initial state (1). This may seem sort of academic (since the parse information is all encoded in the transitions), but it turns out that without this formalism, many common every-day tasks which we take for granted would be impossible. Ok, so maybe that’s not the easiest connection to make, but I think you get the picture. As it turns out, regular expressions are a direct textual representation of deterministic finite state automata. In fact, algorithms for executing regular expressions compile the regular expression into a DFA (using various techniques) and then execute this DFA against the input. It does require an intervening step to convert from a regular expression to a DFA, but it’s not that difficult to do. Now that I’ve managed to lull all of you to sleep, it’s time to get back to more practical matters. All of this formal theory actually has some very down-to-earth applications, including the algorithms required to implement printf. Essentially, this boils down to the following: A substitution format is escaped by a percent sign (%) followed by an optional index, flags, width and precision, as well as a mandatory conversion indicator. The date/time conversion is special and takes a series of formatting parameters immediately trailing the conversion. For the sake of sanity, our parser implementation will ignore this inconvenient fact. We could take this CFG (context-free grammar) and feed it into a parser generator (such as the one built into Scala) and generate an AST in that way. However, in this particular instance there is no need. A cursory glance at the grammar indicates that there is no case wherein the syntax is self-recursive. A minor exception to this is the flags terminal, but this is really just a way of expressing a repetition in BNF-ish style. A moment’s reflection will lead us to the (correct) conclusion that because the grammar is non-recursive, it can also be represented as a regular expression – thus, a DFA. In fact, you can prove this point, but that bit of academic trivia is unimportant for the moment. What is important is to realize that as this grammar is expressible in the form of a DFA, we can actually write code which parses it without too much trouble. Parsers can (and have) been written by hand, but usually when the grammar gets complex, the parser reflects this exponentially. While it is not difficult to write a simple PDA by hand, doing so would be overkill. So rather than starting with the BNF grammar and creating a literal representation, we will work off of the one-line informal syntax and produce a stackless automaton (the defining feature of a pushdown automaton is the use of a stack to maintain recursive state). As it turns out, all of this gobbly-gook expresses very elegantly in functional languages. In truth, I could have written the parser in ML, but it is much more fun to use Scala. We start out by considering how we want the intermediate form to be expressed. Since we’re not writing a true compiler, we don’t need to worry about serializing this IF into anything persistent; we can rely entirely on memory state. For a more complicated grammar, we might write classes to represent a tree structure (commonly referred to as an AST). However, because printf escapes are so straightforward, we can simply generate a token stream. We will represent this as List[Token] using the following definitions. Note that Option is insufficient to represent index because of the < escape (use previous index). Thus, we define a separate series of types with three alternatives: Value, Previous and Default). This is similar to Option, but more specific to our needs. Finally, the flags are represented as an enumeration. Scala doesn’t have language-level support for enumerations, so the syntax ends up being a fair-bit more verbose than the equivalent Java. It is for this reason that enumerations aren’t used very much in Scala, instead preferring sealed case classes and object modules (to serve as the namespace). For those of you unfamiliar with the cons operator (::), it is just about the most useful functional idiom known to exist, especially in conjunction with pattern matching. All it does is construct a new linked list with the value on the left as the head and the list to the right as the tail. Nil is the empty list and thus commonly serves as the tail of a compound cons expression. Our cute use of mutable state (index) makes this code far more concise than it would have been had we attempted to do things functionally. As it turns out, this is the only place is in our parser where we need to maintain state which is not on the stack. Because no lookahead is required, we can simply march blindly through the syntax, consuming every character we come across and transitioning to a corresponding state. If you can get past the sheer volume of code here, it actually turns out to be pretty simple. Each method represents a single state. Some of these states have loop transitions (so as to consume multi-digit precisions, for example), but for the most part, flow travels smoothly from each state to the next. The transitions are defined by the if/else if/else expressions within each method. Note that due to the fact that every if statement has a corresponding else, we are allowed to treat them has expressions with a proper value and thus avoid the use of any explicit returns (improving the conciseness of the code). The final state is represented by the parseFormat(...) method. This method constructs a FormatToken based on the accumulated values and then returns, unwinding our long and recursive automaton branch all the way back to the parse method, which places our token in the list and moves on. Simple and to the point. As a side-bonus, it is possible to rewrite the parse method so that it is tail recursive, allowing the Scala compiler to overwrite each stack frame with its successor. Some of the substitution state methods are already tail recursive, but these loop far less frequently than parse. In fact, if we don’t write a tail recursive parser, we will be unable to handle large strings due to stack overflow. The tail recursive form of parse is nowhere near as elegant, but it gets the job done. Like most tail recursive methods, it makes use of an accumulator which is passed from each call to the next. So rather than parsing the tokens recursively and then constructing the list as we pop back up the stack, we construct the list as we go and return the completed value at the end. The only problem with this is that cons prepends elements to the list. This means that when we finally return the accumulated list, it will be the exact inverse of what we want. Thus, we must must explicitly reverse the list at the termination of the character stream. This actually means that the tail recursive form will require more bytecode instructions than the original, but it will execute more efficiently due to the local elimination of the stack (effectively, scalac will collapse the method into a while loop at compile-time). Hopefully, this has been a thoroughly enjoyable visit to the land of parsing and formal language theory (I had fun anyway). As usual, Scala proves itself to be an extremely expressive language, capable of representing both the theoretical and the practical with ease. It almost makes me want to write a more complicated parser by hand, just to see how well Scala handles it. I’m not entirely sure what I want to do with the result. As I mentioned, Scala needs an in-language implementation of printf, so maybe I’ll flesh out the implementation some more and submit a patch. The unfortunate problem with this is printf is more than just a parser. We can’t just take our token stream and pipe it to stdout, hoping for an epsilon transition. As it turns out, walking this token stream and formatting the substitutions proves to be a very ugly, very tedious task. I’ve already implemented most of the core substitution functionality, but a lot of the more complicated stuff remains undone. If anyone’s interested in the full sources + a BDD specification for printf, just let me know. Parsing is a very interesting science with a world of representations and experiences to draw upon. Even for simple grammars like printf, many lessons can be learned about the fundamentals of computing and just what constitutes a language. And what better language to use in learning these lessons than Scala? Update: Public interest seems to be high enough to merit uploading the full project. You should be able to download using the link below (project managed with Buildr). Could you send me your spec please? I’m interested to see how you and other users are using the library, to refine and improve it. -readability of what the implementation does? Great post! I really enjoy every post you do on Scala. I am learning Scala and (re)learning many FP ideas, and your blog has been a great help. I don’t think I’d be of much help, but I’d still love to see the code and specs if you had time to ship them my way. I considered using parser combinators, however they would be overkill for a number of reasons. The entire syntax for C-style printf can be written as a regular expression, thus there is no need for a full pushdown automaton (as mentioned in the post). DFAs are far more efficient than PDAs (because there is no need for a supplementary stack) and also tend to be easier to work with when written by hand. It’s actually *harder* to properly express printf as a CFG than it is to just bull ahead with a DFA (I had to formulate the printf grammar specifically for this post, I didn’t use it at all in my implementation). It is true that parser combinators would probably be easier to read than my hand-coded approach, but I think the reduced efficiency would be too much of a tradeoff. I haven’t spent much time optimizing my parser (read: none at all), but according to my test results, it’s almost as fast as the well-vetted JDK implementation. If that’s the case, then theoretically I can squeeze at least as much performance out of it, maybe even better. I don’t really have this opportunity if I use a pre-baked parser generator. Awesome blog post! Keep it coming, it’s always fun to follow you on these little journeys!